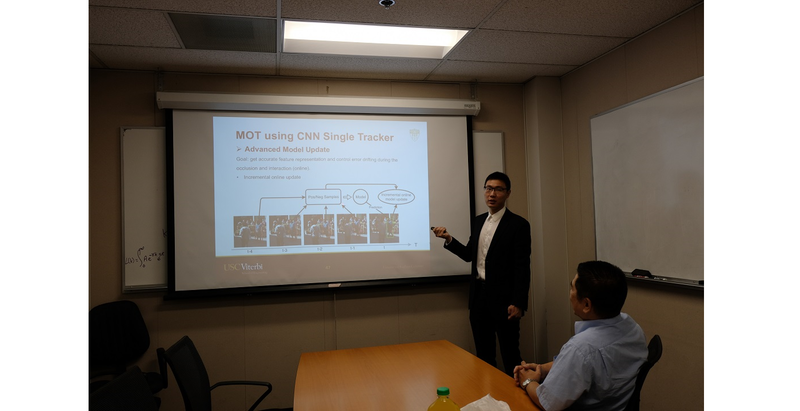 USC Media Communications Lab – Congratulations to Weihao Gan for passing his defense! Let us hear what he has to say about his defense and an abstract of his thesis. Online object tracking is one of the fundamental computer vision problems. It is commonly used in real world applications such as traffic control and safety in video surveillance, autonomous vehicle, robotic navigation, medical imaging, etc. It is a very challenging problem due to multiple time-varying attributes in video sequences. In this research, we investigate two different kinds of tracking problems: single object tracking (SOT) and multiple object tracking (MOT). First, we attempt to achieve online single object tracking using both spatial and motion cues with two novel methods. One is a traditional framework called “temporal prediction and spatial refinement (TPSR)” tracker, consisting of three cascaded modules: pre-processing (PP), temporal prediction (TP) and spatial refinement (SR). Another one is based on convolutional neural network architecture that treats the tracking as a detection problem, called ”Motion-Guided Convolutional Neural Network (MGNet) Tracker”. It has two innovations: 1) adoption of a motion-guided candidate selection (MCS) scheme based on a dynamic prediction model, and 2) usage of a RGB- plus-motion 5-channel input to the convolutional neural network (CNN). From the two proposed methods, we have showed the advantages of combining spatial information and motion cue together to improve the tracking performance. Second, from the proposed SOT technique, we build an online multiple object tracking system with advanced model update and matching. This method treats the MOT problem as an online tracking problem, rather than the global optimization framework. There are three major components in this tracking system: 1) a system platform built upon multiple CNN single object trackers in MOT environment; 2) the proposed advanced online update strategy including incremental and aggressive update mode; 3) a confirmation process for identity matching based on multiple level feature representations. Extensive experiments show that the proposed online update strategy is crucial to train an accurate target tracker and control the error drifting in the future. Firstly, I would like to thank Professor Kuo and all the lab members for all the help during my PhD journey. All of you are my life-long friends and I really cherish this. Secondly, I think one of the most important things, whether in academics or life, is to know what we really want and try our best to achieve that. Thirdly, I feel like we should never be afraid of the difficulties and give up easily. The moment you encounter the difficulties is also the moment you can learn and improve the most. Finally, I would like to wish the best to all the people in our lab in their future study and in life. By Madhvi Kannan|November 14th, 2017|News|Comments Off on Congratulations to Weihao Gan for passing his defense! Madhvi Kannan is a Master's student in Electrical Engineering at USC. She graduated with a degree in Electronics and Instrumentation from R.V College of Engineering, Bangalore India in June 2016. Her current interests are in the fields of Image processing, Computer Vision and Deep Learning.